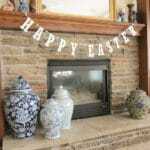 Pottery Barn's 2014 Easter decorations featured an adorable Easter bunnies garland. 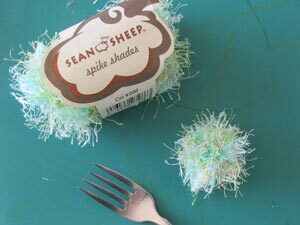 I saw it online as I was searching for ideas for an Easter brunch that I was helping to plan. 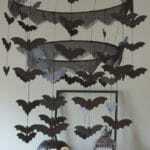 Unfortunately, the $26.00 price tag was WAY out of the price range for decorations. We would need yards and yards of bunnies! 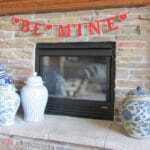 I knew I could make a similar garland for a much lower price when I read the product description. 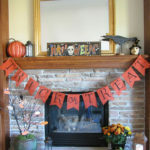 Their banner was made our of fabric covered card stock. 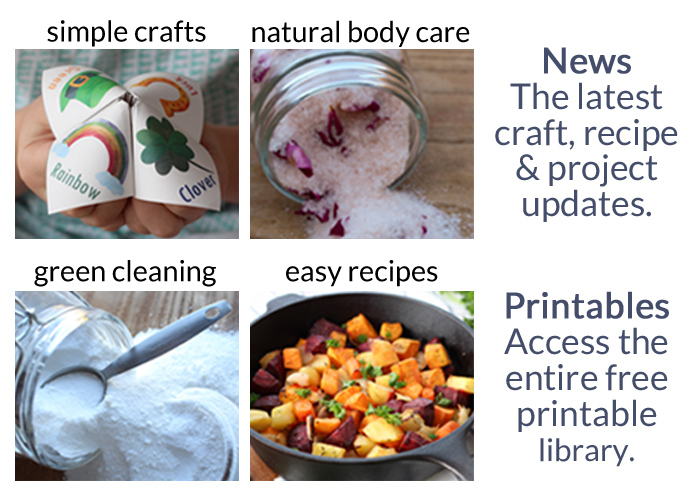 The words “card stock” made me very happy, I love DIY paper crafts because they are simple and affordable. For this project I used printed card stock from my scrapbook stash, white grosgrain ribbon and minky faux fur trim or yarn to make pom pom tails. It was an easy project and it is adorable – all for the bargain price of $5.30. 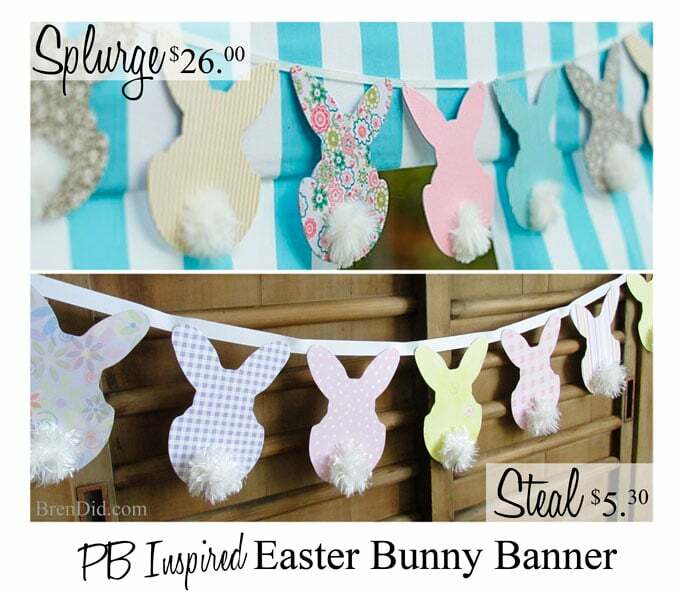 I’ll admit I have gone a little bit Easter bunny crazy and the banners are multiplying like, well, rabbits. 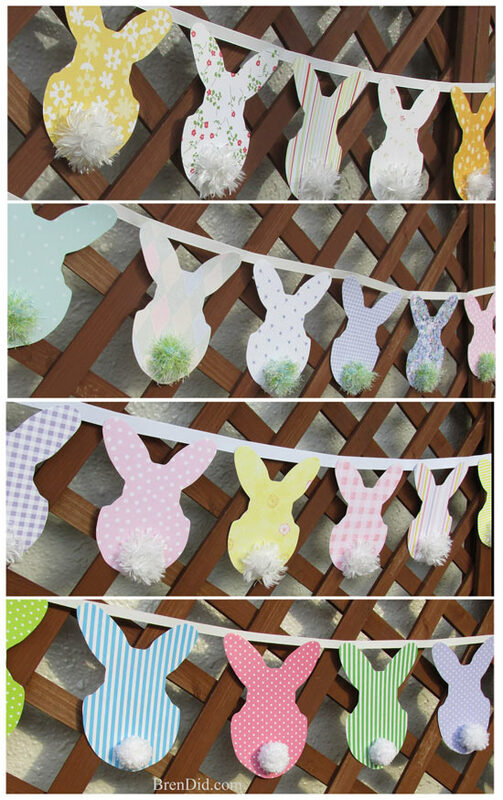 Try making one or a few for your Easter décor. 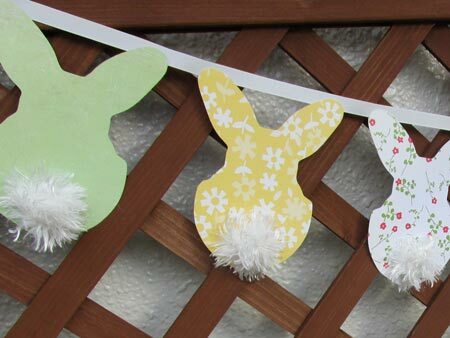 Another idea for Easter decorations is to make the Easter bunnies and use them individually as place cards on your Easter dinner table or write menu items on them to use as Easter buffet labels. If you need table decor ideas check out my matching Easter Buuny Napkin Rings and other Easter craft ideas. 1. Print bunny cutouts on the wrong side of your card stock. 3. Choose your style of bunny tail. 4. 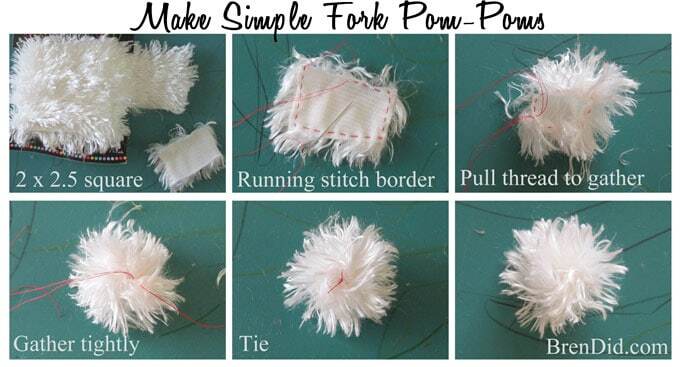 If using minky fabric for the bunny tails, follow the steps to make pom-poms using minky. *I have used red thread for demonstration purposes, use thread that matches your trim. 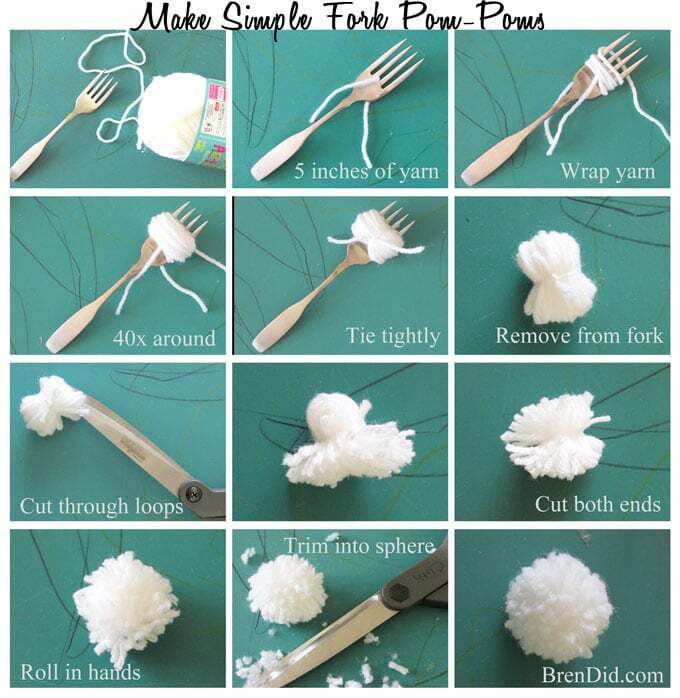 Here's how to make pom poms with yarn. 5. 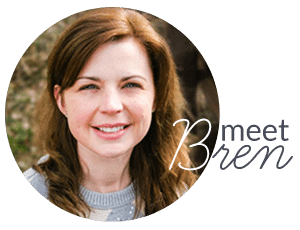 Get your glue gun ready for the next steps! Glue pom-poms tails to bunnies using glue gun. 6. Glue end of ribbon under using glue gun. Next, make hanging loop at end of ribbon using glue gun and a pencil as a guide. Then starting 5 inches from end of ribbon, glue bunnies to ribbon, leave .75 inches between bunnies. I hope this has given you some ideas for Easter decorations. Will you be making any Easter paper crafts this year? Need table decor ideas? Check out my matching Easter Buuny Napkin Rings. Thanks Lorelai! 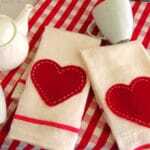 It is an easy craft, I love projects that are simple and cute. I’m so glad you enjoyed the tutorial, Amber. I hope your mom loves it! 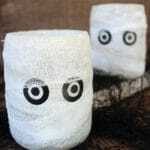 I can totally see how these could start multiplying like mad – adorable! We haven’t done a bit of Easter decorating yet. Think we’ll get busy on these tomorrow. Thanks for a great tutorial! Amy, I hope you enjoy making the Easter banners. I think I have made about 40 feet of them for a brunch I am hosting… thank goodness they are easy!